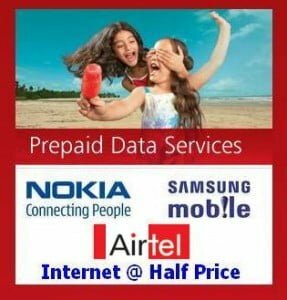 Bharti Airtel India’s largest GSM mobile service operator has come up with 50% discount offer on its Mobile Internet 2GB data plan with newly launched Samsung Wave and Samsung Galaxy S smartphone as well as selected Nokia handset. Airtel Subscribers who buy Samsung Wave and Galaxy S smartphone will get Airtel 2 GB data plan worth Rs.588 (Rs.98 x 6 month) at one time charge of Rs.300 only. To avail this offer, Airtel User has to send SMS ‘SAMSUNG’ to 543210 (toll free) from their Samsung Wave or Samsung Galaxy S handset. The 2GB free data download per month will be credited in customer’s account within 24 hrs of receiving the SMS. Post 2GB data usage customer will be charged at 30 paise/50KB. The handset can be used once to avail the above offer. Offer valid up to 30 September, 2010. On the purchases of selected Nokia mobile phone, Airtel subscribers can get 2GB data plan worth Rs.98 just at Rs.49 only. To activate one has to send SMS DATA to 543210 (Toll Free) Rs.49 will be debited per month up to 2 months. Beyond 2 GB data usage customer will be charged at 30 paise/50KB valid for Airtel Subscribers. The Nokia handset can be used once to avail the above offer. This offer will be made available to our customers from Monday, 24th May 2010. The offer is applicable on Nokia E71 E72, E63, N97, N97 mini, N79, N86, 5523, 5530, 5800 Nokian X3, X6-16GB, N97 Mini, 5130, 5530, 5235, Nokia 6700, 2690, 2220, 7230, 7210, 6303 and Nokia 2730c. I think airtel is the best conection for everythings……. I have nokia mobile model 2690.But i dont know how the net connection activisation with laptob.